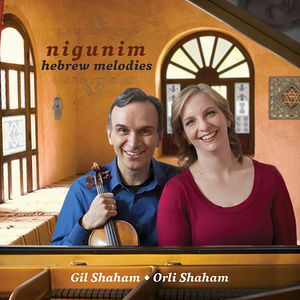 Jewish folk music has always played an integral part in Gil and Orli Shahams' lives. This release includes masterpieces by Ernest Bloch, Joseph Achron, and Leo Zeitlin, and as their idiomatic writing for the violin suggests, they all started their musical lives as child prodigy violinists. Also included is music from the wonderful Schindler's List score by John Williams. The centrepiece of this release comes from the work sharing the album's title Nigunim, commissioned by Gil and Orli from Israeli composer Avner Dorman. Dorman's composition shares the universal appeal of the wordless melodies on which it was named. 'He has created a masterpiece and in my experience everybody who hears the piece falls in love with it they're electrified by it,' Gil explains. Indeed, when he recently toured the work, San Diego Today affirmed that 'it was hard to miss [its] visceral excitement and structural elegance,' the Boston Globe admiring the 'uncommonly intriguing sounds'.